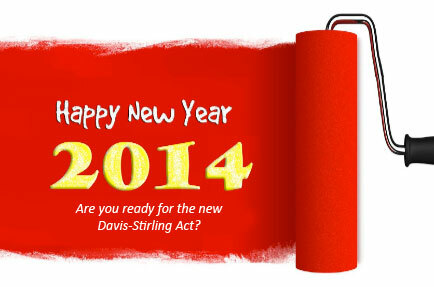 Happy New Year – Are You Ready For The New Davis–Stirling Act? From all of us at SwedelsonGottlieb, we hope you have had a joyous holiday season, and we wish you much success in the New Year! Knowing that one of your New Year’s Resolutions is to learn and understand the new Davis-Stirling Common Interest Development Act (and if you are unsure as to what new Act we are referring to, follow this link for our article “The New Davis-Stirling Act: Get Ready”). We have also prepared a new article that discusses and explains the major changes in the New Act. Yes, most of the language of the old Act has not changed in the new Act. But some of it has, and those changes are significant. What has really changed are the code sections themselves; longer code sections have been broken up into smaller and shorter code sections, and code sections have been reorganized so they are in a more logical order. And there have been some significant changes in the Act which you should know and understand. And follow this link to videos from seminars we held regarding the New Act. Follow this link for SwedelsonGottlieb’s Conversion Table that will tell you the new code section that replaces the old code section in the new Act. For example, the Table will tell you that Section 1350 of the old Act is now Civil Code Section 4000. And if you want to see sections of the new Act or downland a PDF copy of the new Act, be sure to visit lawforhoas or hoalawblog. And be sure to check back (or subscribe) as we will be posting more blog articles regarding the changes in the Act. SwedelsonGottlieb will continue to work hard to master the new Act and the law relating to California community associations to help our clients achieve the best outcomes this year, as we have done for more then 25 years.